I still remember the story we made up together. ​In recent years, I've led hundreds of fiction and non-fiction writing workshops in schools, libraries, offices, and even on hiking trails. (So fun! Shockingly productive, too.) I've worked with everyone from federal inmates to fifth-grade ingrates who thought they hated writing until I showed them a few tricks of the trade. Then I couldn't get them to stop writing. Oh, happy day. ​I’ve visited schools in just about every state in the country—and a few in Asia and Europe, too. I usually do three presentations a day. When working with young students (grades K-2, 30 minutes), I offer gentle writing advice and invite students to create an original story with me on the spot, using the story elements we’ve discussed. When presenting to older students (grades 3–6, 50 minutes), I focus on the writing process: where writers get ideas, how to write a good/bad first draft, and why writing is really rewriting. We also discuss the nuts and bolts of creative writing, including the importance of conflict, journeys, and oh-no moments. I could've listened to this young man read his story all day long. ​I encourage schools to group the students however seems best. If we can meet in a classroom or library rather than a gym or cafeteria, great. If not, I won’t complain. A fourth presentation can be added for a nominal fee. Some schools like to add a 50-minute workshop for a small group (30 students or fewer) of motivated writers. If you’d like to discuss a visit, email me and we’ll compare calendars. I loved working with these entrepreneurs in Phnom Penh, Cambodia. I feel like Oz when I Skype. ​If you're a teacher with a small group (25 or fewer) of motivated young writers (grades 3 and up) and you're looking for a way to take your students' writing skills to the next level, I’m offering a series of three, six, and eight Skype sessions with follow-up letters and one-on-one coaching. Think masterclasses for the middle grades. 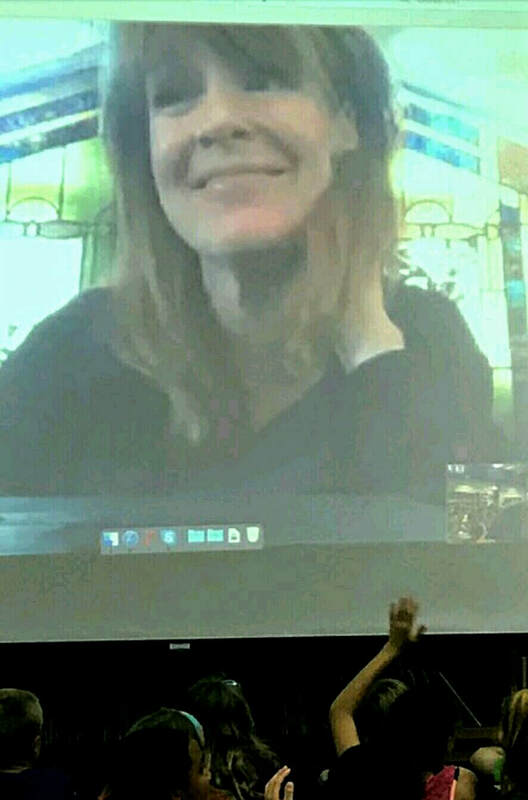 ​Combining Skype visits with old-fashioned letters and/or email is a really fun way to engage the next generation of bestselling authors. If you’re intrigued by the possibility of having an author pen pal/online writing mentor, let's talk about it.